Thakadu River Camp is an exclusive tented safari lodge located in the south-eastern corner of the world-acclaimed Big Five Madikwe Game Reserve. 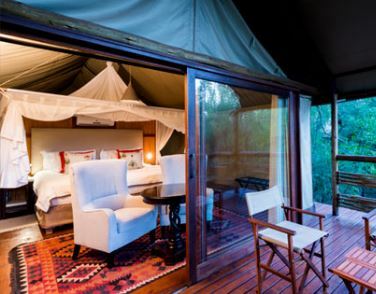 This upmarket River Camp is tucked away amid the dense riverine canopy that lines the banks of the Groot Marico River. And can sleep a maximum of 24 visitors in 12 luxurious canvas suites. The suites at Thakadu River Camp are all built to blend in with the pristine natural landscape and give visitors the opportunity to enjoy the unprecedented beauty and peace that this secluded African bushveld destination provides. Each superbly-appointed tented suite is equipped with a choice of two single beds or a super king-sized bed fitted with a mosquito net, an en-suite bathroom with shower, and a large sliding door that opens onto an elevated wooden deck overlooking the spectacular river frontage. Extra amenities include air-conditioning, tea and coffee making facilities, a hairdryer, digital safe, and access to AC power (220 volts). Being a family-friendly accommodation, four of the twelve suites at Thakadu River Camp are family units. The family units offer the same features as the standard two- sleeper suites plus an additional queen-size sleeper couch suitable for junior visitors under 12 years. A cot is available for infants aged two years or younger on request. The wood-and- thatch main camp at Thakadu lies between the Groot Marico River and one of its tributaries and is decorated in the same polished Afro-centric style prominent throughout the tented suites. Its generous use of organic materials – like stone, wood, and metal – and earthy textures serves to highlight the authentic African hospitality and exceptional service you can expect to enjoy during your visit to Thakadu. Here you will find an open-plan lounge, dining, and reception rooms as well as mini- conference zone, and a safe. The River Camp’s chilled bar and pool area is the perfect spot to while away another idyllic afternoon in this fabulous bushveld oasis. There is also a firelit Boma where locally-inspired cuisine is served al fresco on fair weather nights as well as a Lapa set within a riverine glade from where you can soak up the mesmerising views of the lazily meandering river and the terrain beyond. Thakadu River Camp also has the capacity to host intimate wedding celebrations. Naturally, Thakadu’s outdoor adventures are the focal point of a stay at this magnificent Madikwe-based River Camp with an itinerary that gives you plenty of opportunities to encounter this Big Five Reserve’s thrilling diversity of bird- and wildlife. Activities include morning and afternoon/evening game drives in open 4X4 vehicles, top-notch birdwatching excursions, informative walking trails, and stargazing, in the company of accompanied by highly knowledgeable guides. For a more elite, in-depth experience, a private safari vehicle is available by prior arrangement. Due to safety concerns, junior visitors aged six years and younger are not permitted on regular game drives. However, Thakadu does provide a special “kiddies game drive” as well offering a babysitting service. And if you feel up for some pampering, why not treat yourself to a rejuvenating massage in the privacy of your tent or on your viewing deck. However, you chose to spend your time, a trip to Thakadu River Camp is sure to fulfill your wish to commune with Mother Nature without compromising on your creature comforts. Thakadu River Camp is an ecotourism partnership between the Molathedi Community, African Hotels and Adventures, and North-West Parks which means the Molathedi Community directly and substantially benefits from this partnership. Children between the ages 6 – 12 years will pay 50% of the adultsharing rate. Wake up in the true splendor of Madikwe River Camp, situated along the Botswana border, and start your day amidst nature. Our game drives are led by highly trained rangers with a vast knowledge of the fauna and flora in the area. Take the R21 to Pretoria, then north to Polokwane. After the Zambezi road turno­, take the N4 toward Rustenburg. Once on the N4 take the R556 Sun City/Pilanesberg turno­. Follow the signs to Sun City/Pilanesberg. Pass Sun City for approx 5km, you will come to a 4way stop. Turn right at the 4way stop onto the R565 towards Derdepoort. Follow the road for approx 9km and turn left to Bapong/Mabeskraal. Continue straight (through Mabeskraal village). For approx 35km and you will get to a 4way stop at the end of Mabeskraal village. Turn right to Derdepoort. After 26km the tar ends and a gravel road begins. Continue straight for about 26km, you will pass through Molatedi village. Once through the village, you will see a sign to proceed over the bridge, crossing the Marico river. Proceed for about 7km to enter Madikwe Game Reserve via the Molatedi gate. The gate will be staffed by a member from the North West Parks. Please turn right once through the gate and follow direction boards to Thakadu River Camp. Please keep to the reserve speed limit of 30 kph. Be aware of animals passing over the road. Morning and afternoon/evening game-drives in open game-viewing vehicles, bush sundowners and drink stops on the Reserve, visits to hides. Regrettably, due to safety concerns, children under 6 years of age are unable to participate in game-drives (shorter kiddies game drives can be arranged after breakfast). Game-rich country with Big Five (black & white rhino), elephant, lion, buffalo and leopard) cheetah, wild dog, hyaenas, hippos, kudu, springbok, eland, red hartebeest, giraffe and impala, A paradise for bird watchers. Thakadu River Camp is a wholly-owned Community-based Tented Safari Camp within Madikwe Game Reserve, which is located in the North West Province of South Africa. Thakadu is easily accessible by private charter or the daily Madikwe Shuttle into Madikwe Eastern Airstrip just 45 minutes from Thakadu through the reserve. 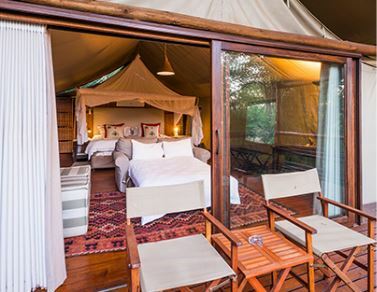 Thakadu River Camp is 3 and a half hour’s drive from Johannesburg on the N4 via Sun City. Federal Air operates a daily flight from Johannesburg International Airport to Madikwe Airstrip, departing at 11H15 and returning at 12H30. Private air charters fly directly to Madikwe airstrip, 25 minutes from the lodge. Morukuru Lodge is easily accessible by two-wheel drive vehicle on good roads. The driving time from Johannesburg is 3.5 hours on good roads. Babysitting facilities are offered ta R132/ sitter/hr.